When shopping around for a reflective roofing product such as a roof coating, it is necessary to research the reflective capabilities the coating is able to provide initially and at 3 years. The Cool Roof Rating Council (CRRC) tests and rates reflective roofing products to provide consultants and building owners with these initial and 3 year unbiased results. While it is very important to select a roof coating that provides high reflectivity initially, it is more important to find a reflective coating that provides high reflectivity for the long run. 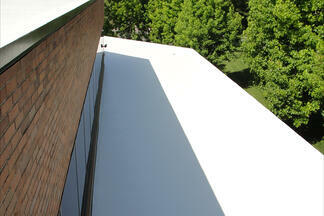 The longer the coating remains reflective, the greater cost savings and benefits you will gain. This is where dirt pickup resistance becomes important. 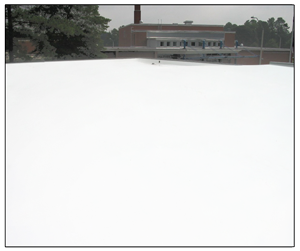 A white reflective roofing product with good dirt pickup resistance is defined as having the ability to maintain it’s white color and appearance even after the roof has come in contact with dirt, dust, and other outside environmental conditions that could darken the surface. 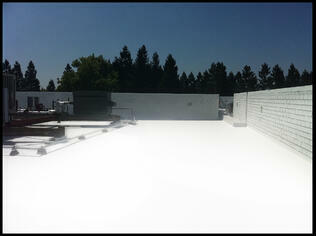 Roof coatings need to have excellent dirt pick-up resistance in order to reflect the sun’s heat away from the building. The coating must remain white in color, allowing the minimal amount of heat absorption as possible, if the coating is expected to preform at a high level years after installation. The darker in color the surface becomes as a result of dirt pickup, the more heat it absorbs. A similar analogy to this is when you wear a white shirt on a hot day; it keeps you cooler than if you wore a dark colored shirt that same day. The more heat the building absorbs, the more energy usage is necessary to cool the inside of the building, increasing energy costs. Depending on the roof coatings dirt pick-up ability, you eventually will lose your “cool roof” and the air conditioning energy savings you were obtaining initially, will be lessened or lost completely. National Coatings reflective roof coatings have been tested and rated by the CRRC to provide our customers with initial and 3 year results to prove and guarantee that our top coats provide industry leading UV protection, longevity and brightness. They are formulated for superior dirt pick-up resistance and protection against biological attach, such as algae and mold. For a list of our CRRC rated products, click here. A reflective roof coating system or “cool roof system” is beneficial to building occupants because they reduce energy costs by decreasing air conditioning usage, these systems improve employee comfort, especially in warehousing and other area’s that are not usually air conditioned, and the reflective capabilities deliver additional protection to your roof top, extending the lifespan of your roof. Building owners and tenants know how expensive energy costs can be, with a roofing system that can lower your indoor ambient air temperature by 15-20 degrees, you can reduce your energy cooling cost by 20% or more. Another long-term cost savings benefit is the ability to protecting your roof from premature aging. These reflective coatings protect your roof from the leading cause of roof failures – the sun’s heat. The sun’s heat causes a rooftop to lose its ability to remain flexible during temperature fluctuations, this causes the surface to dry out, split, crack and eventually leak. Cool roofing systems may also provide saving through rebates and incentives. You can check out DSIREUSA.ORG, a comprehensive source of information on state, local, utility and federal incentives and policies that promote renewable energy and energy efficiency. Lastly, National Coatings has a Roof Energy Savings Tool called R.E.S.T. which is an innovative modeling tool developed by us to help building owners and facility professionals evaluate various roofing systems in terms of their impact on building energy use. Energy use and cost results from R.E.S.T. can be coupled with other cost data in a comprehensive and financially rigorous Roof Life-Cycle Cost Model. This R.E.A.P. (Roof Energy & Asset Performance) Analysis provides building professionals with today's dollars cost comparisons between roof options being evaluated. If you are interested in receiving a comprehensive R.E.S.T. analysis, contact us today! For more information on Cool Roofing, download our Cool Roof Buyer’s Guide!